Lobster (Homarus gammarus) Stock Enhancement in Ireland and collaborative efforts to improve postlarval ongrowing techniques in sea cages without feed supplementation under an Aquareg Project (Interreg IIIc project) involving co-operation between Spain, Ireland and Norway. Ronan Browne, Gonzalo Perez Benavente2, Carlos Marino Balsa3 and Ingebrigt Uglem4. 2. Instituto Galego de Formacio´n en Acuicultura, Nin˜o do Corvo s/n, 36616 Illa de Arousa, Pontevedra, Spain. 3. Centro de Investigacio´n Marin˜as (CIMA), Pedras de Coron s/n, Vilanova, Pontevedra, Spain. 4. Norwegian Institute of Nature Research, Tungasletta 2, 7485 Trondheim, Norway. Abstract: In 1993, the practice of “V”- notching the tail fan of selected wild caught clawed lobsters (used in Maine, USA) to identify them for conservation purposes was adopted by Irish lobster fishermen on a voluntary basis. Legislation was introduced in 1995 to legally enforce this conservation practice, and governmental support was provided to promote the measure. In 2001, the minimum landing size for lobster was increased from 85 to 87mm CL (EU Regulation). In Ireland during the 1990′s, two lobster hatcheries were established. Both using similar production techniques to release over 300,000 post-larval lobsters at a number of locations around the country. Subsequently during an Aquareg project (Interreg IIIc project) involving participants from Spain, Norway and Ireland, work was undertaken to transfer hatchery technologies and investigate novel methods for rearing post-larval lobsters for stock enhancement purposes. 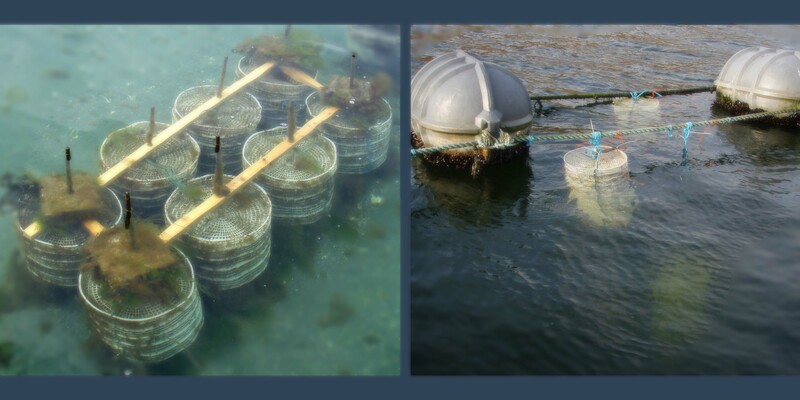 As part of this collaboration lobster growth trials, without the supplementation of feed in oyster baskets were undertaken in Galicia (Spain) and in Ireland. The Irish study involved 250 post-larval lobsters being held individually in oyster baskets at three shellfish farms, where they were periodically measured for growth and survival. Results varied significantly with time and location. Introduction: Lobster (Homarus gammarus) fishing has been an integral economic activity for many Irish coastal communities and is currently managed by the following legislation. 1. A polyvalent fishing license or a pot fishing license is required for the commercial lobster fishery. 2. A minimum landing size of 87mm carapace length (CL) based on EU legislation (2001). 3. It is illegal to land lobsters with visible damage on their tail fan, to protect “V” notched lobsters (Irish legislation 1995). 4. Lobsters cannot be legally caught in either the commercial or recreational fishery by SCUBA. Lobsters can be captured in the recreational fishery without licence. However, these cannot be sold commercially1. In 1992 a lobster hatchery was established in Ireland at the Shellfish Research Laboratory, Carna and the larval rearing (Stage I to IV) techniques used during the 1990′s were based on those described for Homarus americanus2. 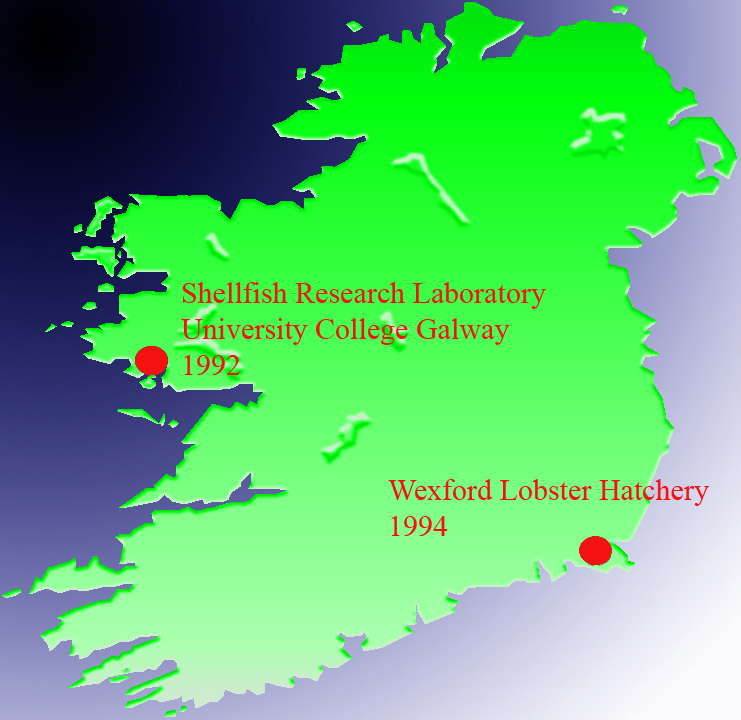 A second lobster rearing facility was established in Wexford during 1994 by a fishermen’s organisation. 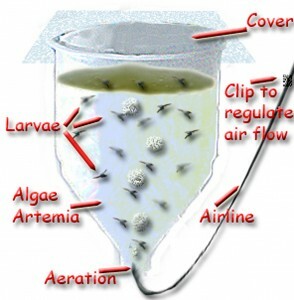 The hatchery methodologies3 used for larval culture in both hatcheries were similar and between them they released a combined total of over 300,000 post-larvae (of which approximately 130,000 were stage IV) around the coast of Ireland between 1993 to 2001. An Aquareg (Interreg IIIc – EU regional fund) project “A regional development strategy for stock enhancement of clawed lobsters” was established in 2004. The purpose of which was to exchange information to develop an improved methodology for producing viable lobster juveniles for release4. To accomplish this, workshops were held and systems in Galicia/Spain established for: (a) Broodstock care and conditioning; (b) Larval rearing; (c) Nursery rearing of post-larvae (Stage IV+); Following on from the successful post-larval oyster basket trials in Galicia5 it was decided to undertake similar growth experiments in Ireland starting in 2007. Materials and methods: In the Spring of 2007, 250 hatchery reared post-larvae with veterinary certification were placed individually into triangular shaped plastic oyster baskets with push fit lids that were held in place by rubber bands and cable ties. These baskets had a mesh size of 2mm and an internal volume circa 1,520cm3 (floor area circa 204cm2 , internal height 7.45cm). The study sites were in Clew Bay under a mussel (Mytilus edulis) raft, Killary Harbour attached to a mussel longline and close to Kinvara at a Crasostrea gigas farm just below low water spring tide level. The lobsters were measured periodically by taking close up photographs of them on graph paper and subsequent length analysis using Adobe Photoshop CS2. 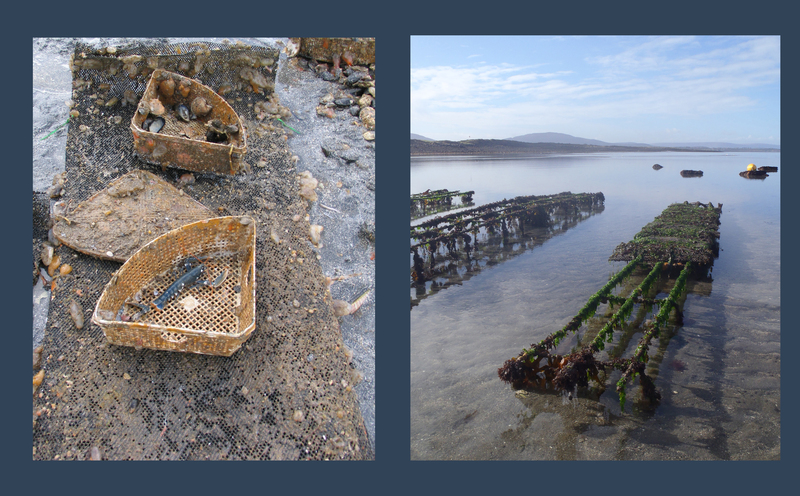 A temperature data logger was attached to the oyster baskets held at Clew Bay. 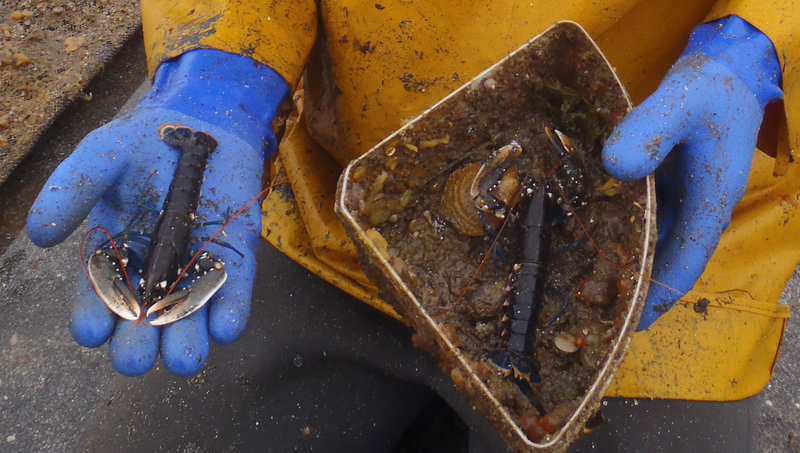 Results: The post-larval lobsters grew from a total length (TL) of approximately 18mm at the start of the trial to 32mm after seven months at all of the three sites, during which time they displayed an exponential growth rate. 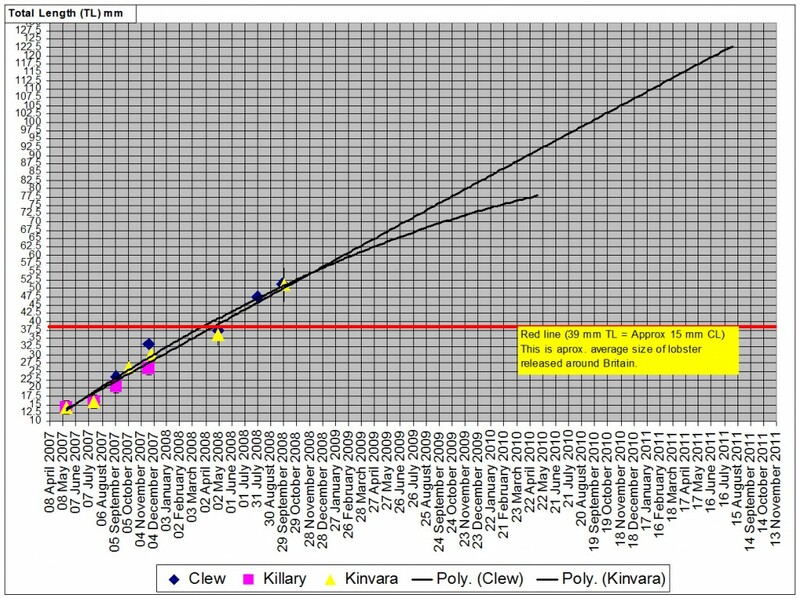 Survival in the baskets over this period in Kinvara and Clew Bay was 78%, while in Killary it was 54%. Thereafter it is thought that a freshwater influx at the Killary site resulted in 100% mortality of the lobsters there. The lobsters at the remaining two sites continued to grow to circa 58mm TL by 26 months with a survival rate of approximately 30%. 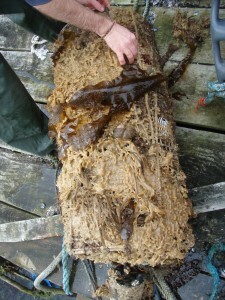 However, it was noted that the growth rate declined significantly in Clew Bay, possibly due to the fouling of the exterior of the cages by Didemnum vexillum. 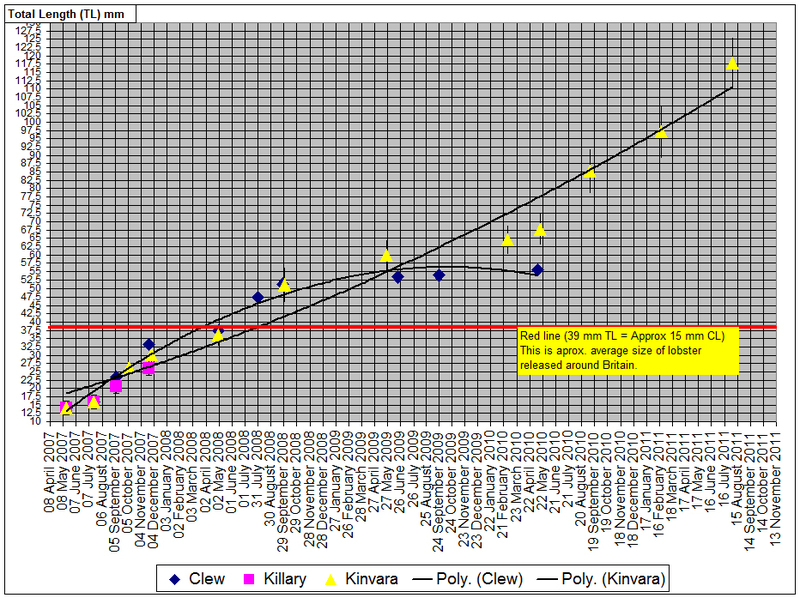 It was also found that the lobsters in Kinvara showed a reduced growth shortly thereafter. When the Kinvara lobsters reached a TL of 64.7mm (2.8 SD) after 40 months, it was decided to transfer them into larger oyster bags (95cm x 50cm x 8cm approximate height) with a 2mm mesh held on trestles. These oyster bags provided an interior volume approximately 25 times greater than the oyster baskets. The growth rate of the lobsters at the Kinvara site increased dramatically and they reached a mean total length of 117mm (7.9 SD) or a CL of 40mm by month 50 with a survival rate of 18% from the beginning of the study. Discussion: An initial finding of this study was that it was possible to rear post-larval lobsters from 18 mm TL to 32mm TL (a CL of circa 12 mm) with minimal human intervention in a period of seven months during the Spring/Summer in Ireland. Micro-tagged lobsters of approximately 15 mm CL were released around the UK (during the 1980′s & 1990′s)6 and Norway (early 1990′s)7. Reported recapture rates of these lobsters around the UK varied from 1 to 5.5% depending on year and site. The gross recapture rate of micro tagged lobsters was about 1%6. Growth of lobsters to 40 mm TL in oyster baskets in Galicia took 180 days during the summer and approximately 215 days during the winter5, while in Ireland growth to 40mm TL took approximately 230 days. From the study of other works done it would appear that the major limiting factors on growth rates of individually held lobsters is floor area8, food8 and temperature9. The type of oyster baskets used in Ireland and Galicia were identical. Therefore it is probable that temperature and food differences created the discrepancies in growth between the countries (however, the lobster reared in both countries were not siblings and genetic differences can not be ruled out). The winter/summer seawater temperature range recorded in Ireland was 5o to 18oC respectively, while that recorded in Galicia was 12o to 20oC. It would appear that the oyster baskets used provided a reasonable environment for lobster growth between 18mm TL to approximately 55mm TL with a survival rate of approximately 50%. Thereafter it is necessary to provide them with an enhanced habitat. It was also noted that the growth rate of lobsters in the baskets varied with season and the specific growth rates were higher during the spring/ summer compared to the winter. This is probably due to variance of feed organisms at different times of the year and temperature affecting the metabolism of the lobsters. It would be interesting from both an ecological and stock enhancement perspective to test alternative field based structures and efficient culture strategies in an effort to achieve growth rates similar to those observed for UK hatchery produced lobsters that were micro-tagged, released into the wild and then recaptured. It was reported that many of these restocked/ recaptured lobsters reached 85mm CL length in four to six years (though there was considerable variation of size at age)6 compared to the 40mm CL observed after 4.2 years of this study. While doing this type of work, further investigations could also be done on survival and long term tag retention in an effort to develop apt fishery models for the species. Conclusion: The trials undertaken in Galicia and Ireland indicate that juvenile lobsters survive and can grow well in oyster baskets. However, there remain many unanswered questions about optimum field based rearing techniques for clawed lobster and efficacy of stock enhancement. Acknowledgements: Thanks to Saul Joyce and IGAFA for the oyster baskets. Thomas Connolly, Simon Kennedy and Michael Molloy for facilitating the trials. The Marine Institute and Alan Drumm for his practical assistance. The Padstow Lobster Hatchery and Dominic Boothroyd for the lobsters. John Hickey, BIM for information about the production of lobsters in Wexford. Tully O, Bell M, O’Leary A, McCarthy A, O’Donovan V, and Nee D. 2006. The Lobster (Homarus gammarus L.) Fishery: Analysis of the Resource in 2004/2005. Fisheries Resource Series, BIM (Irish Sea Fisheries Board), Dun Laoghaire, Ireland, Vol. 6, 2006. ISSN 1649-5357. ISBN 1-903412-17-X. Beal BF, Chapman SR, Irvine C, and Bayer RC. 1993. Lobster (Homarus americanus) culture in Maine: A community based, fishermen-sponsored public stock enhancement program. In P. van Patten (Ed.) Irish-American technical exchange on the aquaculture of abalone, sea urchins, lobsters and kelp. CT-SG-93-95: 57-62 pp. Browne R, Perez Benavente G, Uglem I, Marino Balsa JC. 2009. An illustrated hatchery guide for the production of clawed lobster (Using a green water technique). Aquaculture explained. Number 23 – January 2009, Shellfish File, Irish Sea Fisheries Board, Galway, Ireland.34 pp. Uglem I, Benavente GP, and Browne R. 2006. A regional development strategy for stock enhancement of clawed lobsters (Homarus gammarus). Development of juvenile lobster production methodologies. NINA publication number. Report 211. ISBN 13:978-82-426-1771-2. 39 pp. Perez Benavente G, Uglem I, Browne R, and Marino Balsa C. 2010. Culture of juvenile European lobster (Homarus gammarus L.) in submerged cages. Aquaculture International 18:1177–1189. Bannister RCA. 1998. Lobster (Homarus gammarus) stock enhancement in the UK: hatchery reared juvenile lobsters do survive in the wild, but can they contribute significantly to ranching, enhancement, and management of lobster stocks?. In Gendron, L. (ed.)1998. Proceedings of a workshop on lobster stock enhancement held in the Magdalen Islands (Quebec) from October 29th to 31st 1997. Can. Ind. Rep. Fish. Aquat. Sci. 244: xi+135: 23-32. Uglem I, and Grimsen S. 1995. Tag retention and survival of juvenile lobsters Homarus gammarus (L.), marked with coded wire tags. Aquaculture Res., 26: 837-841. Sheleser RA. 1974. Studies of the effects of feeding frequency and space on the growth of the American lobster, Homarus americanus. Proc. Annu. Meet. World Maric. Soc. 5, pp. 149-155. Aiken DE, and Waddy, SL. 1995. Aquaculture. Biology of the Lobster Homarus americanus. Edited J.R. Factor. Chap. 8: 153-176. Academic Press 528pp. ISBN 0-12-247570-4.